Modem Methods of Plant Analysis When the handbook Modern Methods of Plant Analysis was fIrst introduced in 1954 the considerations were: 1. the dependence of scientifIc progress in biology on the improvement of existing and the introduction of new methods; 2. the difficulty in fInding many new analytical methods in specialized journals which are normally not accessible to experimental plant biologists; 3. the fact that in the methods sections of papers the description of methods is frequently so compact, or even sometimes so incomplete that it is difficult to reproduce experiments. These considerations still stand today. The series was hIghly successful, seven volumes appearing between 1956 and 1964. 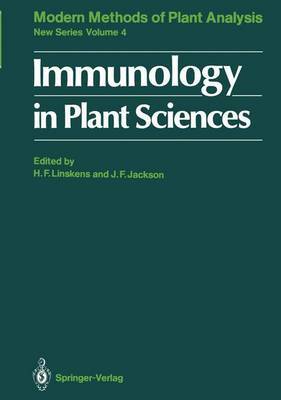 Since there is still today a demand for the old series, the publisher has decided to resume publication of Modern Methods of Plant Analysis. It is hoped that the New Series will be just as acceptable to those working in plant sciences and related fIelds as the early volumes undoubtedly were. It is difficult to single out the major reasons for success of any publication, but we believe that the methods published in the fIrst series were up-to-date at the time and presented in a way that made description, as applied to plant material, complete in itself with little need to consult other publications. Contributing authors have attempted to follow these guidelines in this New Series of volumes.